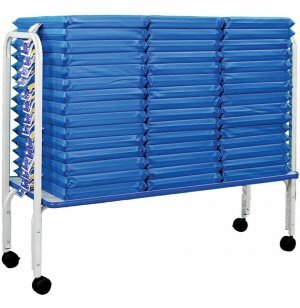 Transport and Store Cots and Mats with Ease! Mahar, a family-owned business, has been manufacturing classroom furnishings for over 20 years. Their furniture line includes youth-sized modular storage units, child lockers, bookstands and specialty tables, as well as toddler cots and mats. Frame constructed from 1"-square, 16-gauge steel. Deck is 3/4"-thick wood coated with High-Pressure Laminate and T-mold accent. 3" hooded and locking casters on all four legs. 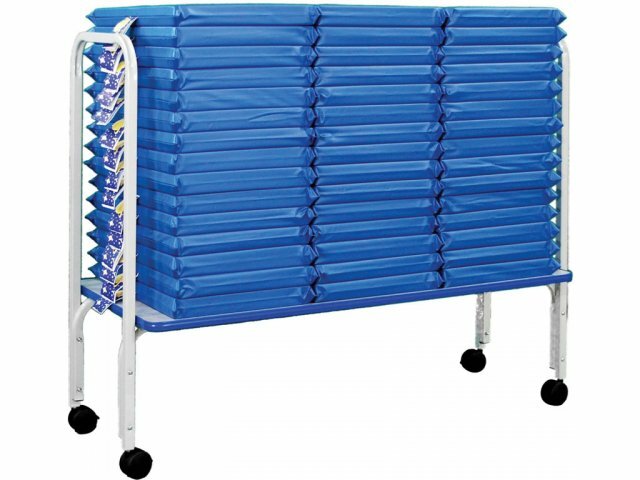 Caddy can store up to fifteen 2" mats or thirty 1" mats.